I spy with my little eye Studs Terkel. The chair with the dog armrests? Does the choir know that an alien has joined them? Mmm. Colleen Gleason. And Christopher Moore. watch it, lady, or we’ll be swapping books through the mail! 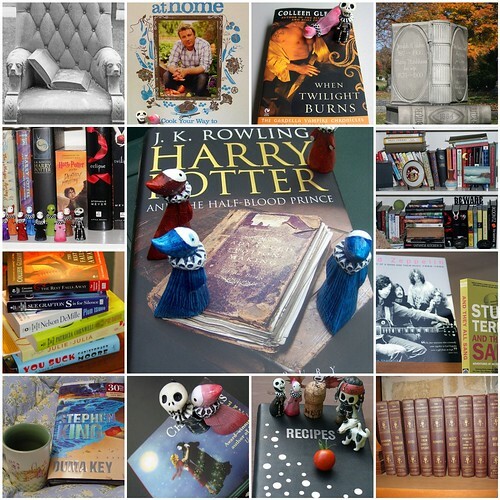 books, poppets and skelly’s?!? heaven! Nelson DeMille is my guilty pleasure. Great photos – but, then I love books! Life is good when books are involved! Very nice. Great pictures for this week’s PH theme. Nice little vignettes there. Very artistic. nice! i love the “jamie at home” cookbook and series. i labor over the recipes that he makes look so casual! Verrrry interesting composition! Did you like the Stephen King book? I haven’t read him since The Tommyknockers, I think, but I heard this one was good. That’s awesome. Thanks for the list. i am almost caught up with the sookie stackhouse books. want to check out colleen gleason next. I’ve always known you have great taste in books.